Googled the name of this (real life) star but didn't find much. Almost all giant stars look like this. This is normal. Shouldn't they be more, um, round? Interesting, I don't think I've ever seen them depicted like that before. Does the same thing go for blue giants as well? I know I probably should have searched before posting, except when I was playing around for the 1st time on SE yesterday I found all the red giants looked, well, the way I expected. So when I saw this one today I really thought this was something weird or even a bug. Then again, this is probably because I hadn't fixed the game yet to use the correct GPU, so the procedural surface wasn't generating properly and they just looked like spheres. No, blue giants are much denser and therefore their surface gravity is much larger (though still quite small). They're unlikely to look much different from normal stars (though in SE you can see very minor bulges on them too if you turn down the exposure a lot). 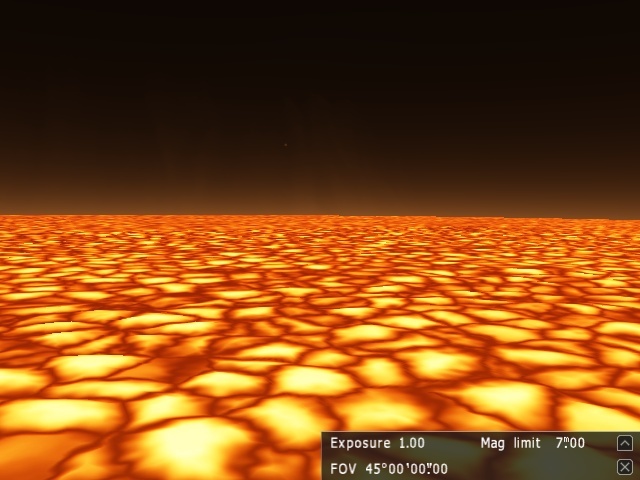 Here's a picture I just took of the surface of a red dwarf. I was just about to post it in the Image Dump, until I read this. Is it me, or are those the same cells you find on red giants, but super-microscopic? No. This is called "granulation" and it is a normal feature of the surface of normal stars. See this photo of the Sun for an example. He's saying whether the generation of the bumps on giant stars is the same way its done on other stars, but blown up. I really don't think that he meant that. And they are rendered in a similar fashion, but I don't think they will be in 0.97. You think that star is weird? What about this Neutron Star? What about this Neutron Star? I know the Neutron Star is a normal phenomena. I was referring to the Neutron Star class in general and how rare they are in Space Engine, hence "weird". It's pixelated. That IS weird! Yeah, bright/blue stars and WD's in general get that sort of pixelated edge. They're not really rare, it's just hard to find because of their low luminosity. If you explore in the universe map mode, you'll see theme all over the place.